by integrating print serials into call number runs, and ensure we have sufficient room for the collection to grow. It is a huge project and a massive team effort, which includes physical shifting, changing digital records, and creating new signage. We have hired a number of summer students to assist staff with this project, who have been working very hard to finish this project in time for the Fall semester. 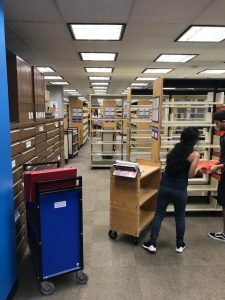 If you need assistance locating print materials over the summer, please ask for assistance from our staff, and we will be more than happy to help!